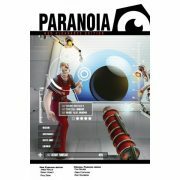 Greg Costikyan, Dan Gelber, and Eric Goldberg’s dark-comedy roleplaying game Paranoia was first published in 1984. The most recent edition, by James Wallis, Grant Howe, and Paul Dean, was released in March 2017, just in time for the Reds Under the Bed review series. How providential! Life in Alpha Complex is pretty sweet. Most citizens (the NPCs) have all the mood-numbing drugs and meaningless drudgery they want, as well as enough carefully vetted entertainment to fill any empty hours. Their every need is fulfilled by the all-wise, all-seeing Computer. Indeed, it is against the rules for them to notice anything that might disturb them. Player characters are not as lucky.